A few years ago, our family started making St David’s Day about doing “the little things” by doing some volunteering, in addition to having a special dinner and/or pub night. We did things like spend a couple hours on a walk picking up litter, get something needed by a homeless person (coat, sleeping bag, a meal or lift to a medical clinic), help an elderly person in our neighborhood run errands or do things like change lightbulbs or rake, walk a neighbor’s dog, etc. There are probably lots of things we can all find to improve our communities or our immediate environments in small and simple ways to make things better, like even just picking up litter. We can do something alone or organize an activity with friends and family. If you like animals, see if a rescue or shelter or even a zoo near you could use some help. A school or library may have a program to help refugees or other people in the community learn the language or customs or a group to provide company and conversation to the elderly. A local school may need help with a project. If you’d like to find organized volunteer opportunities, Volunteer Match lists all kinds of organizations that need help around the world, including in Wales and the rest of the UK, in Canada, in the US, in Argentina and other countries. Check whether your city or country has a site like this with local volunteer opportunities. If you’re in Canada, Volunteer Canada may list opportunities with organizations looking for help. This year, for us, St David’s Day is on a school day and we’ve got two students in our house, so we’re looking for things to do after school, before going out to get some sausage rolls for all and beer for the adults! In our city, Portland, Oregon USA, Hands On Greater Portland is looking for volunteers to help the elderly and disabled do grocery shopping in the morning. Also in Portland, Kindred Hospice is looking for volunteers who can play an instrument or sing to share music with hospice residents at the end of their lives. Of course, we can also all just look out our windows or walk out our doors and think about what we might want to do. Whatever you do, Dydd Gŵyl Dewi Hapus! For years Ceri and I have talked about what we should do to celebrate St David's Day: special dinner, get roaring drunk, what? We decided this year to do something we've been talking about for years - to make St David's Day a day of community service and "do the little things." We made a special breakfast and drug a child out with us as the other two had escaped to their biological father's house. We decided we'd dip in slowly this year and walk a neighbor's dog and pick up litter. Up until about fifteen years ago, I don't remember seeing much litter here, if you dropped a cigarette packet on the ground, twenty people would scream at you to pick it up and stand there and wait until you did, lecturing you on what scum you were for littering. Things have changed, though, and there's plenty of crap thrown on the ground now. We started on the main road near our house and put in about three hours picking up bottles, fast food trash, candy wrappers and gunk thrown in the bushes along the road and paths. We filled up the few bags we'd brought pretty quickly and next time I think I'd like something like a grabber to pick things up with. I recommend gloves, too. Next year I want to plan this better and expand the things that we do by maybe signing up with a community group. You can find productive and positive community groups almost anywhere that are doing things you agree are worth doing and would welcome your help. I'd love to find some other Portlanders who'd like to join us and celebrate after, and to hear if there are other people doing this wherever you are. Now bring on the beer! 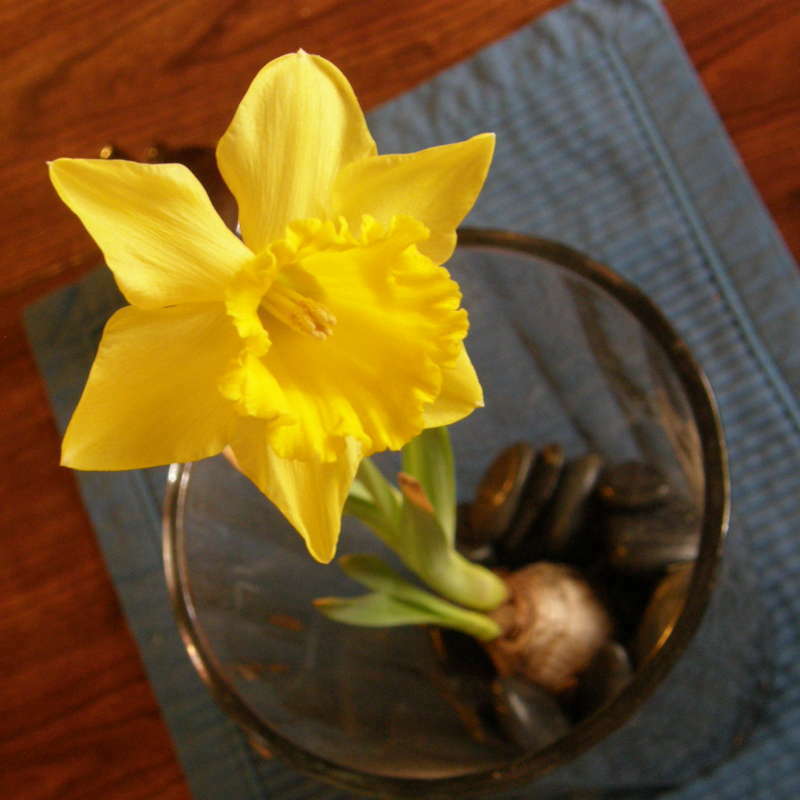 Last year, I decided I wanted a vase or two of beautiful, blooming daffodils on my table for St Davids Day. I knew you could force them to bloom indoors, out of season, so I started looking for directions. Pick your daff variety. The classic daffodil is available all over but there are lots of cultivars: short-stemmed varieties, miniature jonquils, double blooms, short or long cups, different colors, many choices! http://creativecommons.org/licenses/by/2.0)], via Wikimedia Commons" href="http://commons.wikimedia.org/wiki/File:Narcissus_cantabricus.jpg"> . http://www.gnu.org/copyleft/fdl.html) or CC-BY-SA-3.0 ( http://creativecommons.org/licenses/by-sa/3.0)], via Wikimedia Commons" href="http://commons.wikimedia.org/wiki/File%3ANarcissus_cyclamineus01.jpg"> . In case you didnt already know, daffodils are a member of the Narcissus genus and they're all poisonous. Don't let children or pets eat any part of the plant and the sap can cause dermatitis in some people, especially wash your hands if you're handling a baby after you cut daffodils or get the sap on your skin. We were very lucky to get a present of some Really Welsh Duffydils from some lovely people a few years ago and I used these. I did this last year and took pics - these bulbs were a couple of years old, a 2009 product. I was a bit worried they'd be dead and wouldn't produce blooms, because they were so old, but they weren't - they worked perfectly! II couldn't tell from their site if they're selling daffs by mail order. I though they were but can't find it, but give them a try if you want daffodils from Wales. The American Daffodil Society has pictures of many beautiful cultivars to look at and think about on their pages: http://www.daffodilusa.org/daffodils/div.html. They also have a list of suppliers you can order from, all over the world and including the UK, if you don't find what you want locally. 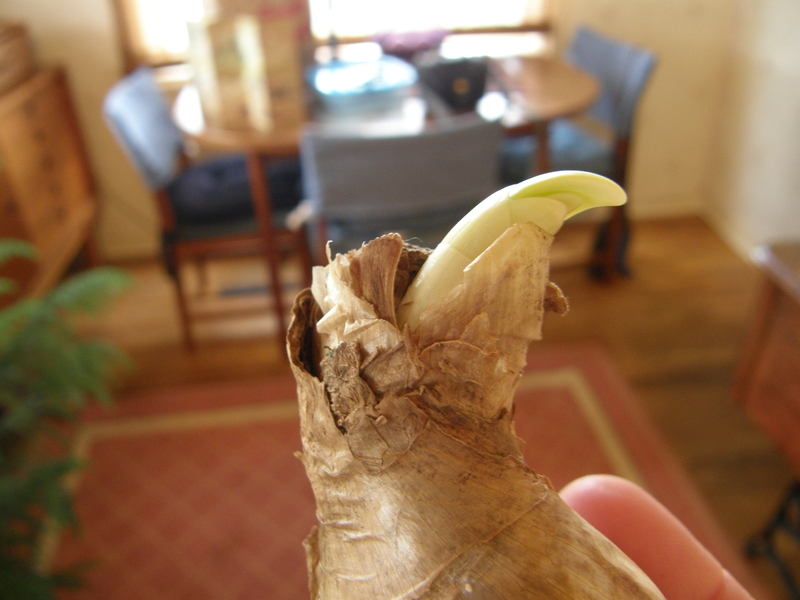 At about six weeks or so, you should have some good roots and shoots on them. Select your container. Make sure the one you select will support the variety of daffs you've chosen. It would probably be sensible to choose a deep container for big, long-stemmed varieties. I did one deep, one medium and one shallow. The flowers in the shallow container fell over a couple of times and wouldn't stand up at the end but before that, they looked frankly awesome in their low, glass bowl. 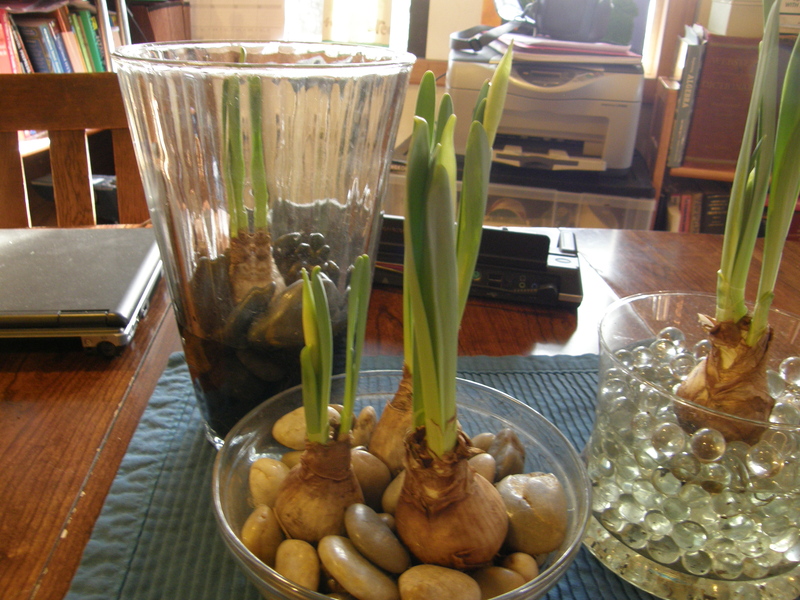 Take them out of the fridge and put them in a vase or container in a bed of pebbles or stones (or marbles or whatever), about two thirds up the bulb, root side down. 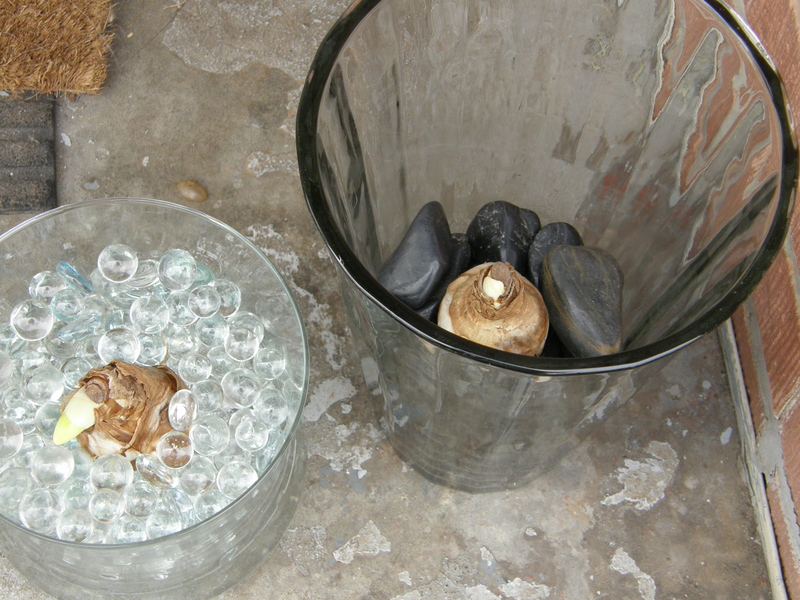 Cover the rocks with cold water. They need light now, so move them to a cool spot in the winter sun, about 60 or 16 and watch them grow. It was mild where we live that winter, so I put them out on the porch. When they get a bit tall and start to show blooms, move them to your table or wherever you're going to enjoy them (and show them off!). They were bright and tall and beautiful, and they looked absolutely great on the table.